Do some journal writing beforehand. Whether you do morning pages, proprioceptive writing, or a just a simple inventory of what’s in your heart and on your mind in your journal prior to pulling your CotD, the card will be more meaningful to you. Ask a specific open-ended question to focus your intention for the CotD. Some good ones include: By what wisdom can I live today? What part of myself seeks healthy expression today? What do I most need to know or learn today? What does the interaction between today and me look like? What is my greatest resource today? What is my most helpful strategy today? What cue tells me that I’m on track with _____ today? In the morning, jot down a few thoughts about your CotD. At night, revisit the card, reflect on the day you’ve experienced, and find your inner and outer experiences in the card’s concepts and symbols. Write down any helpful, evolved qualities that you perceive in your CotD. Turn these qualities into doable, concrete, manageable actions to perform that day. Embody the card instead of intellectualising about it. What ideas do YOU have to help people understand their card of the day? Please share in the Comments section. 1. What was the nature of the relationship between Name and me at the beginning? 2. What is the current nature of the relationship between Name and me? 3. What is the best that this relationship with Name can be by [specifiy a date or time frame here]? 4. What am I receiving from the relationship that I truly require? 5. What do I require from this relationship that I am not receiving? 6. How can I respectfully request this from Name? 7. What is Name’s most likely response to this request? 8. What is the most important thing for me to know or learn about this relationship between Name and me? I hope that some of you find this helpful, not only in romantic relationships, but also in your exploration of business partnerships, friendships, connections with blood family members, and more. Please feel free to leave feedback in the Comments section. It feels like another good time to share what I’ve been reading with you. Here are four books that are enriching me, personally and professionally. I hope that they nourish you in some way, too. Tarot Face to Face: Using the Cards in Your Everyday Life (Marcus Katz & Tali Goodwin). This practical and enjoyable text gets us using the cards right away with essential skills and methods to help us notice and interpret tarot symbols with ease. My favourite activities include dialogue with the cards (a very fluid manner of doing a reading), the finding possibilities method (very helpful for people who need a shot of hope), the telling a person’s story method (a simple yet deep way to do a two-part reading in any setting), the oracular poetry activity (creative, interactive, and surprising), and the tarot walk (a great way to personalise one’s knowledge of the cards through the “real” world). People of many levels of tarot experience will find something of value. The Friar of Carcassonne: Revolt Against the Inquisition in the Last Days of the Cathars (Stephen O’Shea). The story of Bernard Délicieux, a Franciscan friar who denounced the inquisition’s (and the church’s) misuse of authority and abuse of power in late 13th and early 14th century Languedoc. His spiritual conviction and his dedication to his homeland are inspiring. Reading this reminds me of the dangers of any form of fundamentalism, the soullessness of any institution that craftily changes its original mission in order to simply keep perpetuating itself, and the beauty and power of living one’s authentic spirituality in our world. History that’s compelling to read. Partner Earth: A Spiritual Ecology (Pam Montgomery). The author points out the split that exists within us and in our culture between the physical and the spiritual, then she invites us to rediscover and reaffirm our partnership with Earth and all its beings. We are introduced to devas, energy beings who are allies in healing the split. Montgomery keeps it simple, suggesting that no one needs to be “special” or “psychic” to tune in to Nature, partner with it, and engage in healing of self and world. It’s our birthright. Intuitive Astrology: Follow Your Best Instincts to Become Who You Always Intended to Be (Elizabeth Rose Campbell). I’m actually revisiting this book, something I do every couple of years or so. The astrological birth chart is not treated as a fatalistic statement, but rather is seen and employed as a map and creative springboard for uncovering our most profound questions and our own responses to those questions. Twelve people’s real-life stories are featured to make the concepts useable and inspirational. Chapter Eight, my favourite, puts it all together. We’re guided through our astrological birth chart in order to identify and/or affirm our dreams, discover inner and outer resources and allies to support those dreams, give them a home in the world, and amp up the joy level so we can really thrive in this lifetime. A treat from cover to cover! Sadly, Campbell died of cancer in 2004 at the age of 52. I like to tune in to my work in a variety of ways so that I can make sure it is authentic for me and helpful and useful to those who consult me. One interesting way is to use the tarot to illuminate parts of my astrological birth chart. I often use a system of correspondences from the Golden Dawn and Builders of the Adytum that connects certain planets and signs to specific tarot cards. This time, I thought I’d try a different system, so I used the Tarot of the Holy Light by Christine Payne-Towler and Michael Dowers. My focus was on the 10th House of my chart, the section of the diagram that is related to career, public reputation, what one does consistently in the outer world. In my work, the life-giving source teaches people through breakthroughs. The revelation of people’s true nature acts as spiritual medicine. I guide people through revelatory experiences that reconcile perceived opposites in themselves and in their lives. The heart is suddenly released in order to become the primary teacher. The true centre breaks through and radiates harmony. I’m a poetic and practical guide. I’m the tribe’s oracle who gets in touch with primal forces and returns from that experience with stories that evoke others’ practical intuition. I’m a shamanic troubadour who guides people to practical advice. My work is a hub for a network of intuitive bards. My work generously guides people to get in touch with the dwelling place of their heart and soul so that they can tune in expertly to instinctual powers and become excellent administrators of their everyday lives. I love these ideas! It’s enjoyable to use the tarot and astrology in this creative way to brainstorm possibilities for my work. This activity provides me with more images and phrases to guide me as I offer tarot counselling, circle process, and other wisdom ways in our world. What’s YOUR special blend of guiding images and words? You can share ideas here AND you and I can explore it together in a personal session or in a workshop setting. Let me know! This is the third and final installment on the Tarosophy conference I attended almost two weeks ago. It focuses on Day Two of the gathering created by Tali Goodwin and Marcus Katz. In addition to antique tarot decks coming back into our community’s awareness, a non-tarot oracle deck is making a comeback in certain quarters. The 36-card Petit Lenormand pack seems to be hot right now, too. One of its great advocates and practitioners is Rana George whose workshop we attended on Sunday morning. Rana took us on a whirlwind tour of reading pairs, trios, and a traditional spread called the Grand Tableau that employs all 36 cards. She recommended learning one system of Lenormand really well (use a journal), then do what we want with it. Rana said that reading Lenormand cards is primarily about combinations and context. Questions should be as specific as possible, including those about time frames. She suggested to keep things simple; don’t try to make more of the cards than is there. Rana’s use of well-known novels/stories as reading examples brought the method to life. I came away with a fresh appreciation for this deck and the ways in which it can be used. The next session was offered by Carrie Paris. It was a profound experience of what tarot counselling can be. Carrie showed slides of pieces of art and of tarot cards from the Thoth deck and invited us to relate to them on four levels: literal, allegorical, inner reflective, and mystical. In pairs, we described images, found pieces of our own story in them, and contemplated the insights. Some of us performed what Carrie calls the sacred gaze, a moment of simply being with the other person in a way that is beyond words and allows the tarot-inspired insights to really take us to a spiritual level. This experience of the Strength card’s energy was very moving. It was fascinating to see and hear that Carrie often has clients create mandalas and altars based on their tarot consultations. She also created audio-video pieces that she sends to clients. These involve tarot images, other visual art, and music and poetry being read aloud. She invites people to listen to the poetry as if an aspect of themselves is reciting it to them. The conclusion of the conference, with Marcus Katz at the helm, was enjoyable. We took part in a simple ritual involving the Rose and Key theme that had been playing out all weekend (and for two years prior), then Marcus revealed a couple of wonderful upcoming projects. The Tarot of Everlasting Day, a deck to be released in three stages, will be completed over the next eight years. And a book on the Golden Dawn and the tarot, illustrated with many original manuscripts, will be published in the not-too-distant future. Our “survivors’ dinner” at Razzoo’s Cajun Café was great fun as was the night-time conversation at the hotel. Then it was off to bed to make the plane ride home next morning. Such a satisfying tarot immersion. Here’s to the next one! Image: XXIV, The Ring from the Tarot of the Nine Paths by Dr. Art Rosengarten. 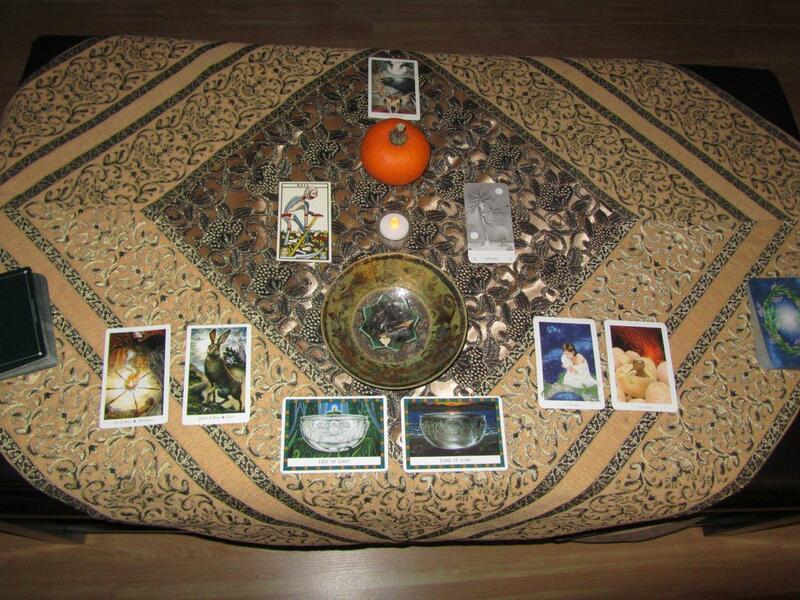 Using several tarot decks and one non-tarot deck along with a candle and smudge, we created this altar for Samhain. It reflects the common gifts of our ancestors, how we can carry those gifts into the world in our own lives, and messages for the coming year. It emerged as we drew cards.